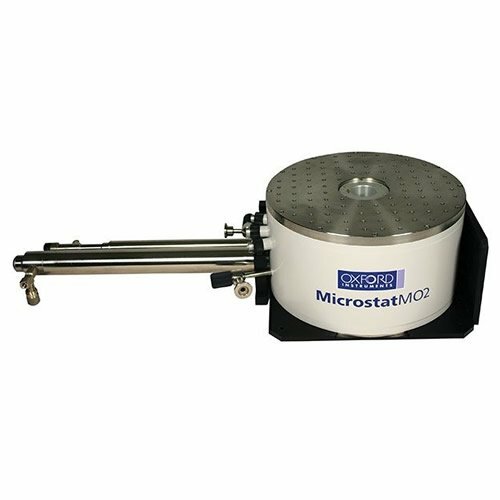 Our microscopy cryostat with magnet - MicrostatMO2 is a compact stable optical cryostat, which provides a cryogenic environment (6 K) ideal for sensitive optical and electrical measurements in magnetic field (up to 5 T). Supplied with the new range of electronics MercuryiTC temperature controller and MercuryiPS power supply. • Microscopic optical measurements, such as Photoluminescence and Raman scattering under varying magnetic field. Study of microstructures such as quantum dots / wires / wells and nanostructured semiconductor devices. • Flux visualisation of superconducting materials. 5T magnetic field extends the range of samples that may be studied to include materials with strong flux pinning. • Electrical transport measurements using very small currents for nanoscale samples, quantum devices and nano-devices. • Measurement of dimensional changes of magneto-restrictive materials.